I might have mentioned just how quickly time seems to fly away from me every time I sit down to work on a new post. Labor day seems to have been weeks ago, though my lobster-red "suntan" clearly dictates otherwise and the first day of school, which feels less of a big deal every year, has already gone by. It feels like yesterday that I was anxiously waiting for that September day myself with a backpack full of my favorite new things, notebooks and pens. Now speaking of the good old grade school days, its in terms of 10+ years ago, the thought certainly puts a scrunchy expression on my face. The plan that morning was for a peach filled clafoutis, but the peaches purchased at the grocery store the night before proved to be bland and tasteless. Then my mom mentioned that there were a couple buckets of freshly picked plums from our trees in the backyard. Some butter and plenty of sugar later, the dish was going into the oven in time for breakfast. I typically refrain from being "gushy" over things including fabulously delicious dishes such as this one. I hope that statement gives indication of just how good this is and believe me when I say that I managed only a few bites before the entire dish was gone. This was another recipe that took a few tries before I got what I wanted. My first try came from the recipe contained in Mimi's cookbook, I had been working thru a handful of her recipes and this looked so delicious, my mind ran away with the possibilities. The density wasn't quite what I was looking for, I couldn't call it failure though since I had never had a clafoutis before so onto round two I went. 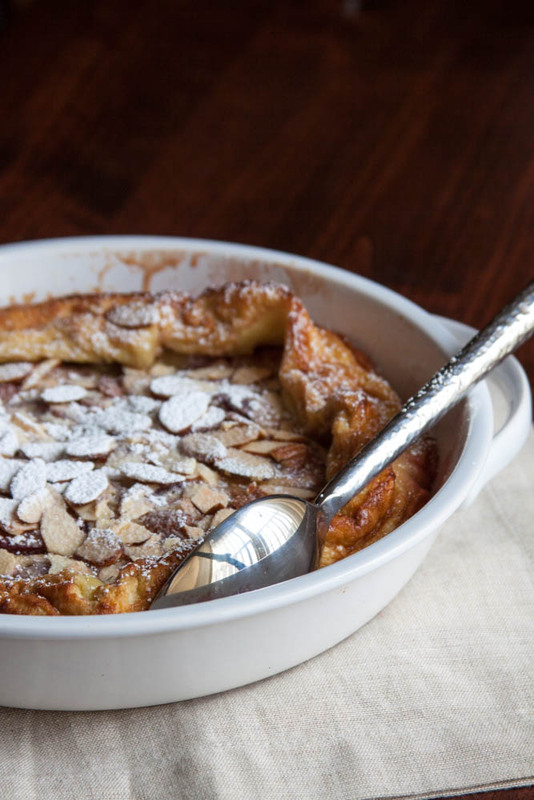 The recipes I came across had me rather surprised, the variation in proportions of flour to milk and cooking times had me wondering just what an authentic clafoutis should be like. Regardless, this one defiantly hit the spot with a softly set custard engulfing rich and equally tender fruits. Heat your oven to 425F and set the empty 9-inch (1 quart) baking dish or pie plate into the oven. Combine the toasted almonds and 1 Tbsp sugar, set aside. Melt butter in a 10 inch skillet until bubbling. Add the quartered plums and cook until softened, 1-2 minutes. Sprinkle 3 Tbsp of sugar over the fruit and turning, continue to cook until the sugar melts and syrup thickens (3-4 mi). Take off heat and stir in the amaretto, set aside. In a separate mixing bowl whisk together flour, salt and remaining 3 Tbsp of sugar. Add eggs, whisking until smooth, followed by half & half and vanilla extract. Continue whisking until completely combined. Remove the baking dish from the oven, add butter (about 1 Tbsp) and grease entire dish. Spread fruit and syrup evenly across the bottom and then pour the custard on top. Bake clafoutis for about 10 minutes before adding the sugared almonds on top. Continue to bake for an additional 5-7 minutes, the clafoutis should have risen quite a bit by now and the edges should be browning. Allow to cool for about 5-10 minutes before serving. The clafoutis will have deflated and you can dust the entire generously with confectioners sugar. Serve & enjoy!